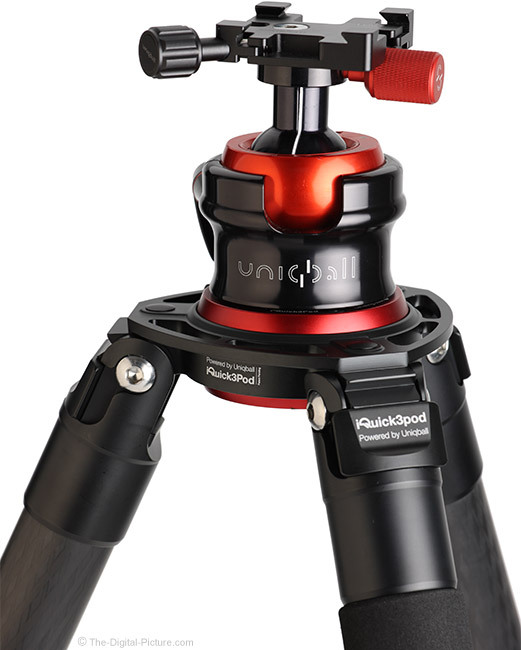 The UniqBall IQuick3Pod 40.4 might be the strongest, most rigid tripod I've ever used. Add this one to your short list. I know, there is already plenty of confusion in the tripod market with a huge number of options available. You know that choosing a high quality tripod is photographically important and adding another brand to my short list that includes Really Right Stuff, Gitzo and ProMediaGear adds complication to the decision-making process. Along with an increasing number of quality tripod options becoming available, differentiation becomes more difficult. 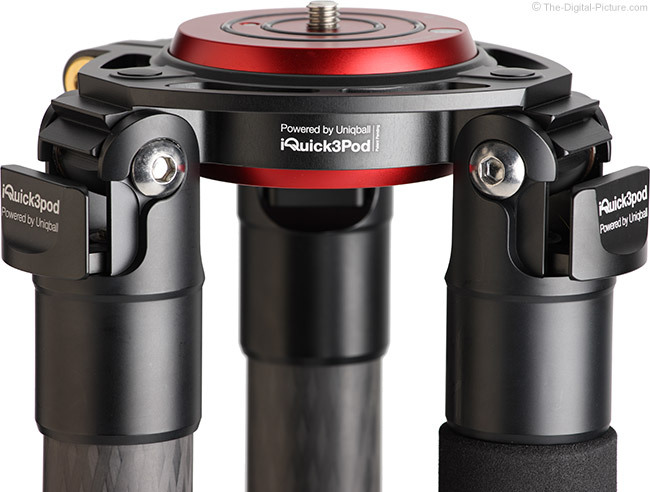 With part of the word unique at the start of their company name, at least some design aspect of this tripod had to be different and the unique design element in the UniqBall IQuick3Pod tripod line is the leveling base integrated into the tripod's spider. 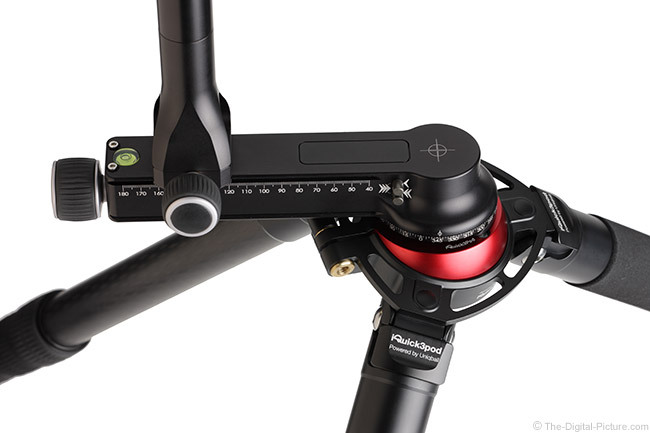 No longer is an accessory with its additional cost and weight required for quickly leveling a tripod head. A couple of years ago, UniqBall sent me a UBH 45X Ball Head. Full of skepticism, I put that head and its unique leveling capabilities to the test and came away impressed. I continue to use that head along with a mix of best-available others in my kit. Still, I was skeptical about the IQuick3Pod 40.4's integrated leveling feature. Considering my good experience with the UBH 45X head, I accepted the tripod on UniqBall's condition that I evaluate it thoroughly. Jumping to a hint of the conclusion, I was not disappointed. This tripod features an excellent design with quality parts and robust construction for an overall package that will be ideal for many photographers. As I'm sure you are aware, tripods come in a wide range of sizes and weights. You can carry the lightest tripod all day and barely know it is there while the heaviest tripods will become a burden in a very short period of time. Strength and rigidity are often the balancing factor between size and weight. A short, heavy tripod is likely much stronger and more-rigid than a tall, super-light model. So, tripod selection involves finding a model that offers the right balance between dimensions and weight, along with the features it offers, for the need. Here are the UniqBall IQuick3Pod 40.4 Carbon Fiber Tripod's measurements and specs. The numbers in the top row of this table are extremely high, indicating that this is one of the strongest tripods available. Few of us will put even 1/4 of that amount of weight on our tripods, even when using the largest lenses available. But, tripods are often used to hold a camera motionless and rigidity typically comes with a high weight rating with lower sharpness-robbing vibrations being experienced. That weight rating means that long focal length lenses can be solidly mounted and that higher winds speeds, to name one common source of vibrations, can better be photographically tolerated. Note that this weight rating is derived with the leveling base included in the calculation. Some accessory leveling bases cut the tripod's weight rating in half. The taller a tripod is, the more likely it will accommodate your eye-level height or your eye-level height with one or more tripod legs positioned downhill below you. The latter is a frequent occurrence for outdoor photography as well as those shooting from stairways, etc. At the same time, it is nice to be able to quickly fully extend a tripod and have it at perfect normal standing height. While this is not an especially tall tripod, it has very adequate height for me (6'/1.8m) to comfortably shoot from a standing position on level and gently-rolling land scenarios. Remember that your tripod ball head and the camera/lens' tripod-mount-to-viewfinder height add significantly to the tripod's height during use. On a level floor, the viewfinder of even a small camera mounted to a full-size ball head atop this tripod is positioned slightly higher than my eye level. While high is good, so is low. Getting the camera right down on the ground can be ideal for some compositions and also for table-top work. Without a center column or leveling base handle impeding it, this model goes to a really low 3.7" (9.4 cm). A tripod's folded length is of primary concern for packing. 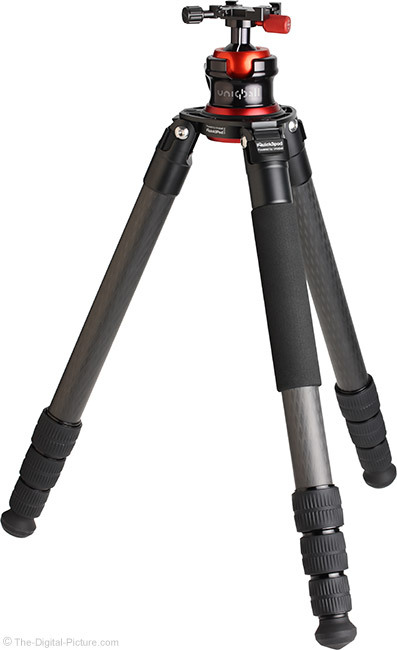 A smaller retracted tripod, regardless of its maximum height capability, consumes less space. This means it is easier to fit into luggage and it does not rise as far above a backpack. The UniqBall IQuick3Pod 40.4 folds down to a very manageable 22.6" (57.4 cm), an average size for its class. At 5.7 lbs (2.59 kg), this is one of the heavier tripods I've used. However, it is lighter than some 5-series carbon fiber models that it compares most closely to in specs. Leveling bases add weight that must be accounted for in comparison. For example, the Really Right Stuff TA-4 Leveling Base weighs 19.9 oz (564 g). This base displaces some original top plate weight, but the overall weight gain is noticeable. So, for the overall package, this tripod is comparatively light. The chassis is a substantial part of the tripod and it puts a mark on the overall weight and width of the tripod. However, as a rule, the larger the chassis and the closer it is to a triangle in shape (vs. a circle with leg pivots attached to the outside), the less able it is to flex and in turn, the more rigid it is. Thus, I'm interested in the chassis max width measurement. The IQuick3Pod 40.4's chassis is a very substantial 5.2" (13.2 cm) in width, yet ventilated for weight savings. While the diameter of the top plate may hint at the strength of the tripod's chassis, it more-directly ties into the base size of the head being attached, though often a differing-size head base will fit fine. Either way, the smaller diameter of the two could be a limiting factor for stability. This tripod's measurement across the perimeter of the top-most portion of the top plate, the surface width available for contact with a head, measures 3.09" (7.83 cm), large enough for most heads. Important to note is that the size of the head will be the limiting factor for range of motion for the leveling base. More about that is coming soon. All other aspects being equal, larger diameter leg sections will provide greater stability and lower vibrations than smaller diameter leg sections. Leg wall thickness and construction details of course come heavily into play here. In general, you carry a tripod by the top leg section and very thick leg sections can become more difficult to control. The 1.58" (40.0 mm) diameter top leg section is rather wide, though it is not uncomfortable to hold and carry. The other three leg sections measure 36mm, 32mm and 28mm. Tripod manufacturers typically offer many different models and the model name often describes how the model fits into the family. 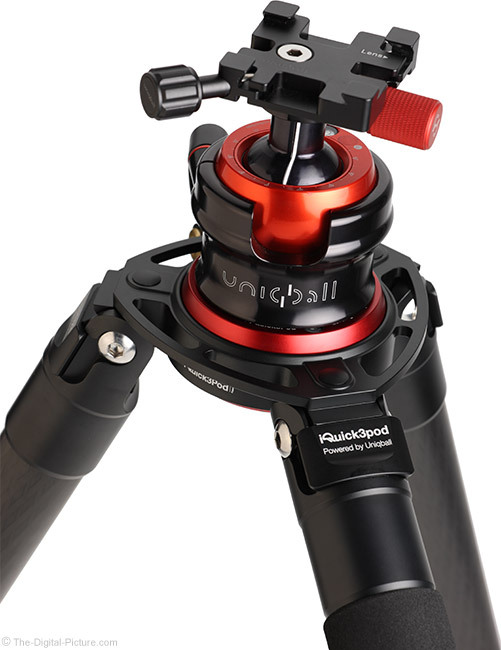 The UniqBall IQuick3Pod 40.4 Carbon Fiber Tripod model name breaks down as follows: IQuick3Pod is what UniqBall names their tripod line. The "40" refers to the 40mm top leg section diameter and the "4" refers to the 4-leg-section design. Starting at the top of the tripod, we have the part that holds everything together. UniqBall refers to it as the "spider", but this part is also referred to as the "chassis", "main casting", "spreader", "apex", "collar", etc. The chassis' size and strength are very important for the overall strength and rigidity of the tripod. The IQuick3Pod 40.4's CNC-machined aluminum alloy spider is substantial in construction, featuring a ventilated metal rounded-triangle-reinforced design that very solidly integrates with the leg axles and angle locks. This is a split design that locks very tightly with the spring-loaded, repositionable lever lock. Notice the substantial amount of metal surrounding the leg axles in the above image. I often carry a tripod vertically oriented with a hand gripping the top of a leg, just under the spider. Any sharp design features where the chassis meets the top of the legs meets not-well-padded parts of the hand. Thus, a smoothly-design leg to spider transition and spider bottom can make a big difference in the comfort of carrying a tripod. This model provides average comfort with the wide leg angle locks and spider bottom being just slightly uncomfortable. There are three 3/8" threaded easy link ports in the spider, hidden under the round bumps visible just above each leg angle lock. The port covers are removed from the bottom using a flat-end screwdriver and a large range of accessories such as extension arms can be mounted. The ventilated spider provides attachment points for ... anything you wish to clip or hang, from a stabilizing weight (such as your backpack) to a tripod strap. What if the entire tripod spider became a huge ball head housing with the top plate becoming the ball? That is the design IQuick3Pod tripods feature and that design makes these tripods unique. Ball heads are frequently favored by photographers, in part because they can be quickly leveled. But, sometimes a level tripod is needed, such as when using a ball head's panning base for panorama capture and for using heads with only two axis of rotation, including gimbal heads. This tripod makes leveling a tripod base easy. A short, roughly 1/4 (or less) turn of the split spider's fully-tightened locking lever permits free movement of the thick aluminum top plate with the plate being retained by a ball and socket design. 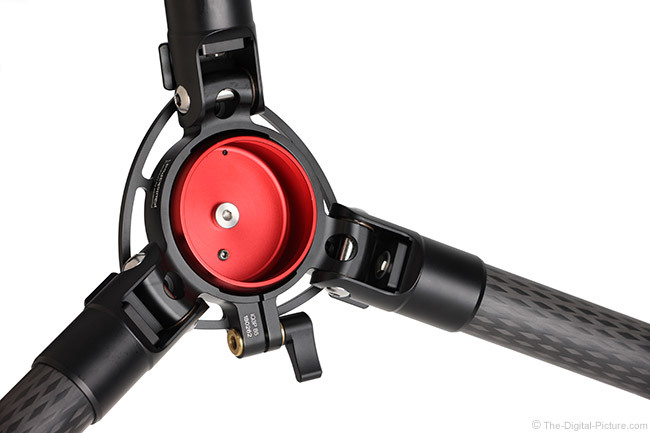 The plate rotates 360° in any direction and is only limited by the size of the tripod head (or other mounted gear) that will impact the sides of the spider, preventing further movement (caution should be used to avoid scaring the attached gear upon impact). The 360° movement capability adds another option and that is mounting gear upside down. The top plate's movement is smooth and the spider locks the top plate very tightly. With pressure evenly applied around the top plate, the top plate and spider effectively combine as one for a rock-solid surface. Nice would be to have a way to recenter the top plate in the spider, such as via a shallow groove in the top plate with a few small lightly-spring-loaded balls to click into that groove, but ... that exact alignment position seems seldom needed. Also, a click stop may impede precise leveling in the near-click-stop positions. When the top plate mounting surface is (only) vertical and oriented with the split in the spider, a position that would never get used otherwise, the top plate can be released through the bottom of the spider. The design is ingenious. 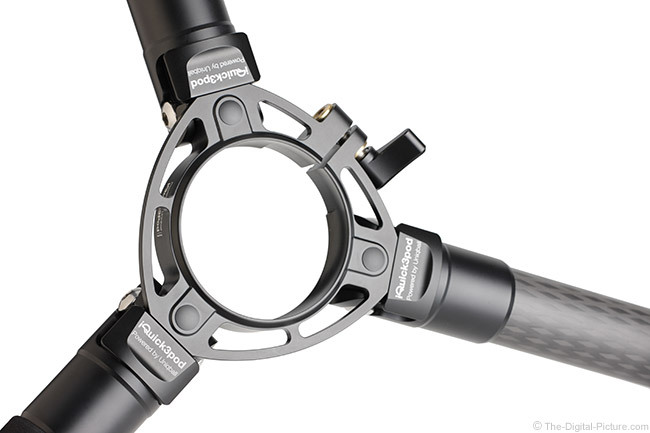 With the top plate removed, the spider is ready to accept Gitzo Series 5 Systematic accessories including a center column or video half ball. UniqBall will soon offer its own accessories with a 15.7" (40cm) center column coming first. A spirit level is positioned at the outer edge of the top plate and is important for indicating the levelness of the top plate. However, the level is not visible when tripod heads with a base diameter over 2.6" (33mm) are used, including the UniqBall UBH 45X Ball Head. The level is as visible as possible in the above image. I don't see how this design issue could have been avoided, but if the head has to be removed to see the level, much of the convenience of the integrated leveling base is lost. Most tripods can be leveled with some leg adjusting and most quality tripods have a spirit level, but the IQuick3Pod design is far easier to level – when the bubble level is visible. Some heads have an appropriate alternative level available on them (including the UniqBall heads), avoiding hidden level issue. Another option would be to install a quick release clamp on the top plate (one that does not block the level) and a dovetail mount under the ball head for quick head installation and removal. Wait. If the tripod already provides the ball head feature, why is a head even needed? The answer is that the head is not necessarily required. If your application does not require significant head movement, a camera, lens or clamp can be directly mounted to the tripod with no tripod head needed. The limiting factor for the top plate angle is the mounted gear impacting the spider and a direct-mounted camera will not clear a big upward or downward angle. But, adding a small tripod head riser such as the Acratech 1045 Tripod Head Riser will free up a far greater range of motion (as will even taller models). 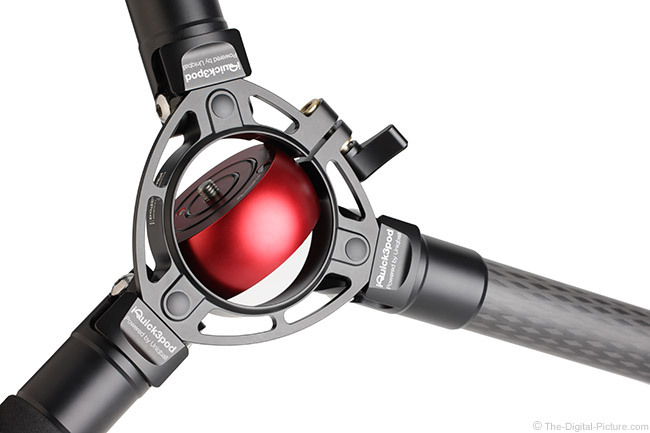 This riser and a quick-release clamp will cost far less than a quality ball head, will be potentially stiffer and the weight savings will also be quite significant (perhaps 1 lb / .45 kg). 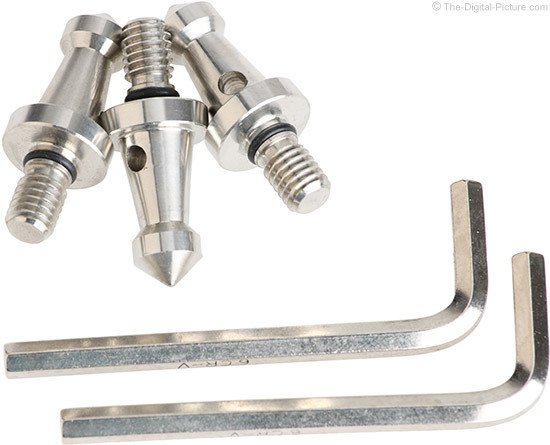 The tripod head mount screw is the common 3/8"-16 thread size that fits most appropriate-strength head models. No hook is provided under the top plate. Unless you are only going to use the tripod on a completely flat surface, typically a floor, you want a tripod model with independent leg spread. You want your ILC (Interchangeable Lens Camera) tripod legs to open at various angles to accommodate whatever terrain you may encounter. Models having independent leg spread feature angle stops around the leg pivot axles and this seemingly basic design feature plays an important role in the tripod's functionality. One of the primary tripod design observations to make is how strongly the leg angle locks transition into the stops provided on the chassis. Avoid models with a weak little tab protruding from the spider as they risk breakage and are susceptible to vibration. 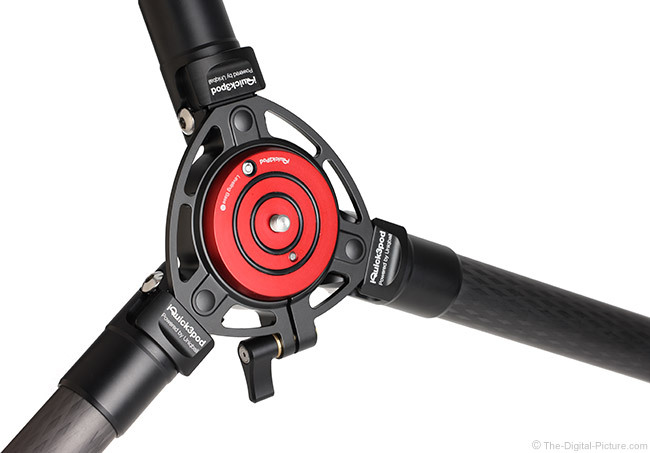 This tripod is ideally designed so that the weight distribution goes straight through the leg cups and into spider through substantially-strong angle locks. Most tripod models offer three leg angle stops, the specific angles made available are seldom a strong differentiator between models and this one has the three seemingly-normal positions at 25.5°, 55° and 85°. The wide, flat-faced leg angle locks are robust and substantial in size. They function smoothly and with their overhang on both sides of the leg (slightly uncomfortable for carrying), they are easy to grasp. This design does not feature spring-loading angle lock ratcheting. Don't like the force required to spread the legs? Loosen or tighten the axle bolts with the included wrenches. Leg angle movements are smooth and the review model had ideal resistance out of the box. Like the apex, the legs are a critical part of a tripod. A primary consideration for tripod legs is what they are constructed of with aluminum and carbon fiber being the two most-common options. "Should I get an aluminum or carbon fiber tripod?" is a question. One advantage of a carbon fiber tripods is that they typically have a lighter weight than equal-load-rated aluminum models and another big carbon fiber advantage is its ability to better dampen vibrations. Carbon fiber does not transfer heat as easily as aluminum and if using the tripod in cold temperatures, you will much-appreciate holding the carbon fiber model. Also for consideration is that carbon fiber is less susceptible to corrosion than aluminum - especially if used in/around salt water. Aluminum is a great material and its primary advantage in tripod form is low cost. Aluminum generally has a lower friction coefficient than carbon fiber, making leg sections slide more easily during length adjustment. Aluminum dents and bends while carbon fiber breaks. Neither is good and the latter is less likely, but dented and/or bent may remain usable. Carbon fiber is my nearly-exclusive choice for larger-than-tabletop models. Everyone loves the look of woven carbon fiber, right? UniqBall's 10x layer carbon fiber tubes look great. Another important aspect to tripod selection is leg section length along with the number of sections per leg. Roughly, the number of leg sections times the length of the sections (minus some overlap and plus the chassis height along with the leg angle set) determines the maximum height of the tripod. Also, the length of the leg sections is a strong factor in a tripod's retracted length. General purpose tripods are most frequently offered in 3 or 4 leg section models and I generally choose 4-section legs for my primary tripods. Four leg sections give me a relatively-compact retracted size that is especially appreciated when traveling along with a maximum height that works well for me. With quality-constructed tripod models, and especially this one, I don't find the stability of the thinner lower leg section to be an issue. 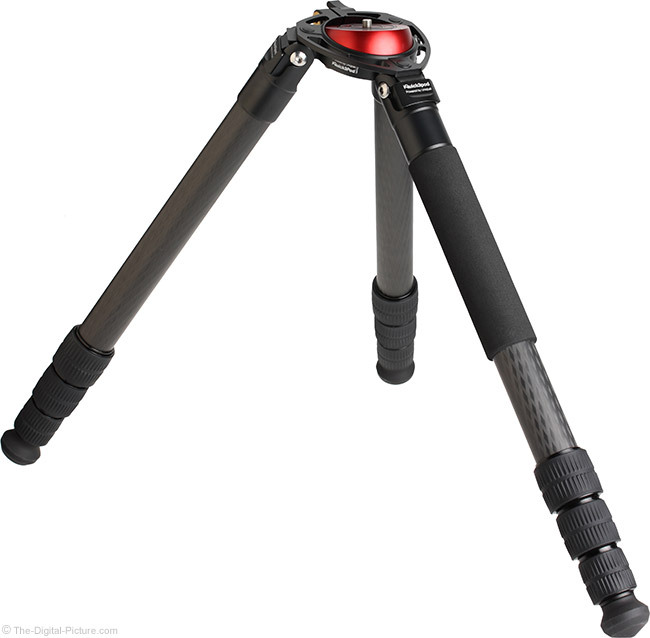 The IQuick3Pod tripod's legs slide with the smoothness I associate with a quality carbon fiber tripod model. One of the three legs has a neoprene-padded grip surface. 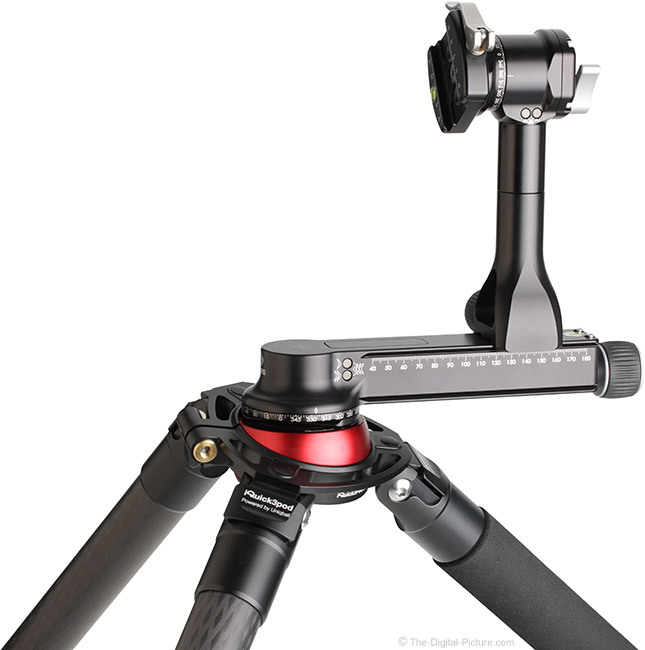 Most tripods have multiple legs sections, allowing them to be set up at various heights or retracted compactly. This means that leg section locks are needed and the first choice to be made is often between lever or flip-locks and twist locks. I've used both and much-prefer the twist locks. Twist locks, especially the short-rotation designs such as those featured in the IQuick3Pod, are fast to use (fast can be very important). With less than 1/4 turn required to release and a crisp resistance change providing tactile feedback, these substantially-sized (especially long) locks are very nice to use. With one leg fully extended, these leg locks will not retract under the vertical pressure of my weight (170 lb / 77 kg). To further test the strength of a tripod, also testing the chassis' strength, I fully extend the tripod legs, spread them to the first stop on a non-slippery surface and then hang from them. Again, exceeding the weight limit risks breaking the tripod (and there is a chance that I will hit the ground fast if that happens). The UniqBall IQuick3Pod 40.4 Carbon Fiber Tripod easily holds my weight and, taking the test to the next level, even holds my bouncing weight with the legs on an epoxy (slippery) floor surface. No worries here – this is an extremely strong tripod. Important to me is that the leg sections do not rotate when unlocked, allowing any individual leg lock to be tightened before the others. Most quality tripods made today support this feature and the UniqBall IQuick3Pod 40.4 Carbon Fiber Tripod checks that box. Lateral rigidity is a primary responsibility of the leg section locks. Applying lateral pressure (but not too much as this is a breakage risk) to fully locked legs will quickly illuminate any play and/or flex that exists. Also, with the tripod setup and legs fully extended with modest pressure on the top plate, a tap to the middle of the extended leg will cause visible vibration. How quickly that vibration dissipates is the observation to make during this test. This tripod shows less flex and vibration than most (all?) other tripods I've tested. A minor leg lock concern I have with this model is that the rubber grip surface on all three lower leg section locks slips slightly after becoming fully tightened with additional pressure added. This minor slipping hasn't been a problem, but it is slightly disconcerting from a long-term perspective. UniqBall assured me that this design prevents the threads from being over-tightened and damaged and that the required pulling force is provided with the current solution. O-ring leg lock seals are not provided but the tripod easily disassembles for thorough cleaning. At the bottom, we find the feet and with thick leg section tubes come big feet. The IQuick3Pod 40.4's rubber feet are substantial in size with thoughtfully-designed molded angle shapes to confirm to the leg set angles available. The feet are wide enough in diameter to support the tripod with the legs fully splayed. The feet are molded onto threads, making them removeable. Substantially-robust spikes are included in the box. In addition to securing a tripod in less-than-ideal conditions, the spikes seem potentially useful for fending off bears. The load capacity of this tripod is high enough to support any camera and lens combination I can conceive of. But, being able to hold large weights doesn't always mean that it will hold loads without vibration and vibration cannot always be tolerated. At this point in the review, you are not likely surprised to hear me say that there is no concern with this tripod in that regard. With the legs fully extended and a 600mm f/4 lens mounted to an Arca-Swiss Z1 Ball Head, vibrations caused by a firm slap against the camera body were settled in 2 seconds or less. That is very impressive and as good as any tripod I've used. The UniqBall IQuick3Pod 40.4 Carbon Fiber Tripod is easily big-lens-support-ready with no currently-produced Canon, Nikon, Sony or other DSLR lens being too large or heavy for this model. The right tripod head can make a huge difference in your tripod experience and in your results. The bottom line is that you should not let your head to be the limiting factor in your stability. It seems fitting to mount a UniqBall head on a UniqBall tripod. The UniqBall UBH 45X Ball Head seems to be the best match, but as mentioned earlier, this head's base covers the top plate's spirit level. Also, this head's unique leveling feature is partially redundant with the tripod's integrated leveling base, though the 2-way movements remain advantageous. The Arca-Swiss Z1 Ball Head is one of my all-time favorites and its base leaves just enough of the level visible to be useful. 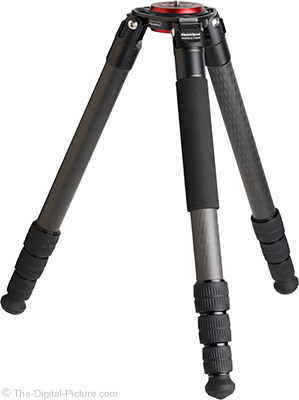 With a very high load rating and excellent performance, the Z1 is a great choice for this tripod. As I work through this review, "robust" is the word that keeps entering my mind. Look carefully at the product images shared in this review. Every part is significant in size and strength. The design is nice and fit and finish are good. I would prefer the leg locks to be narrower, but it is hard to find a complaint with this tripod otherwise. It is well-designed and should last a very long time. Finding the right case for a tripod can be challenging. Available options seem to be wrongly-dimensioned (and they tend to be somewhat expensive). That UniqBall (at least at review time) is including a nice padded nylon case that is optimally-sized for the tripod and a reasonably-sized head (4" in height works well) is very beneficial. This case has both shoulder and hand straps. The double-pull zipper extends the length of the case and wraps around the head for easy access. 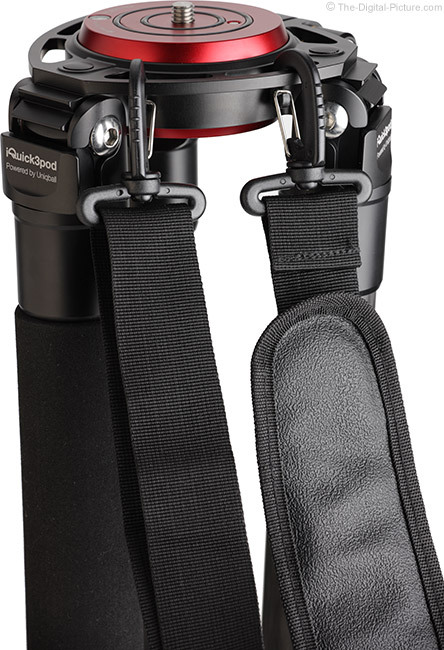 Especially nice is that the tripod case strap can be used to carry the tripod itself, simply by clipping the strap to the open areas on the spider. As I keep saying, cheap, low-quality tripods are usually a waste of money. They will leave you disillusioned to what a tripod can do for you and will dissuade you from using one at all. Your time is valuable and researching the purchase of a tripod costs you in that regard. The cost of a tripod failing, either mechanical failure or failure to function at a satisfactory level, can be far higher and this results in having to invest the research time over again. Of course, paying for a replacement tripod is similarly inefficient. Buy right the first time and spend your time photographing (and enjoying the gear you are working with). Along with high quality and high load ratings comes a high price and the UniqBall is investment-priced. However, that price starts looking much better when the alternatives such as Gitzo and Really Right Stuff are compared and even far better when the leveling base and included case are factored in. Thus, I'll call this tripod a very good value. 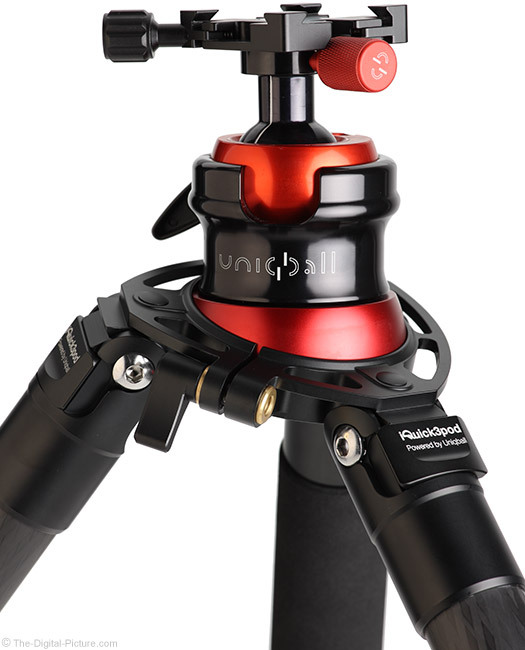 The UniqBall IQuick3Pod 40.4 Carbon Fiber Tripod used for this review was provided by UniqBall. 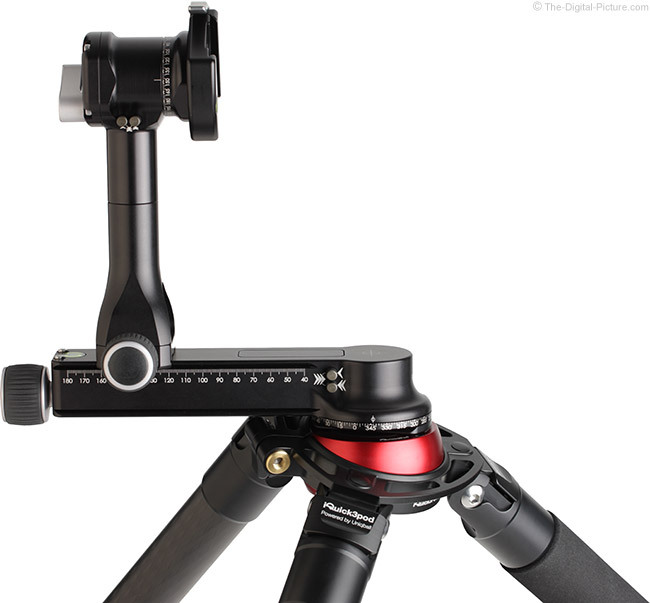 The UniqBall IQuick3Pod 40.4 Carbon Fiber Tripod has siblings! The UniqBall IQuick3Pod 36.3, extending to only 48.0" (121.9 cm), is going to be found short by most. However, the UniqBall IQuick3Pod 36.4 with its 55.9" (142.0 cm) height will be found a great option by most. The 3X.X models are very similar to the 40.4 in design, but slightly smaller, slightly shorter and modestly less expensive though still rated to hold a very significant 77 lb (34.9 kg) load. The 40.4 competes at a level typically considered "5-series" in the tripod market (or 4-series for Really Right Stuff). I've owned a lot of Gitzo tripod models and think very highly of them. Their 5-series models are excellent, but in terms of solidness of support, the UniqBall 40.4 seems at least as good and probably a little better (I don't have the Gitzo to make side-by-side comparisons with at the moment). I have not used RRS's 4-series models, but they should be at least as impressive as the UniqBall from a performance standpoint and modestly better from a design standpoint. You will be impressed by how much less expensive the UniqBall option is. * The RRS TFC 3-series tripods weigh about .4 lbs (0.18 kg) less than the comparative TVC models and the difference is .2 lbs (0.09 kg) for the 2-series. As with cameras, lenses and camera cases/backpacks, I'm of the belief that one cannot have too many quality tripods. Often two are needed at the same time, tripods are needed at different locations and having a variety of sizes and strengths available makes life better. Where does the UniqBall IQuick3Pod 40.4 fit in? The UniqBall 40.4 is going to be overkill for short focal length lenses under ideal conditions. But, when the focal lengths start getting long and/or conditions get bad, this tripod is up to the task. This is the perfect tripod option for mounting a big lens on a gimbal head. This is an extremely strong and rigid tripod that competes very well against the best, holding the largest camera and lens combinations rock solid. The differentiating ball and socket spider design is quite useful, providing integrated leveling base functionality that reduces setup time without the cost, weight and load reduction of an accessory. With good build quality and thoughtful design, the UniqBall IQuick3Pod 40.4 is a smart choice for your most-challenging stability needs.